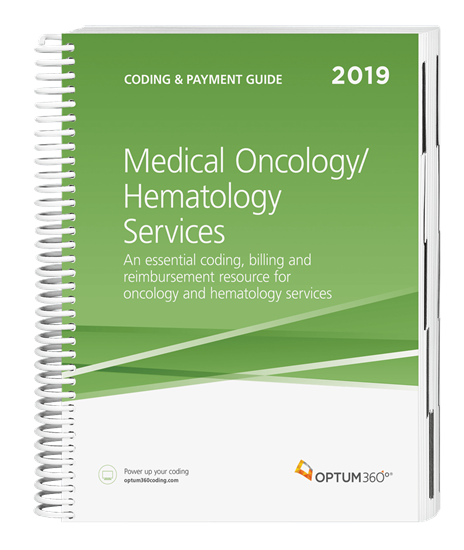 Our new Coding and Payment Guide for Medical Oncology/HematologyServices is your one-stop coding, reimbursement, and documentation resource developed exclusively for oncology and hematology medical services. This comprehensive and easy-to-use guide is updated for 2019 and organized by specialty-specific CPT® codes. Each code includes its official description and lay description, coding tip, documentation and reimbursement tips, Medicare edits, and is cross-coded to common ICD-10-CM diagnosis codes to complete the coding process. Getting to the code information you need has never been so easy. Evaluation and Management Services. Evaluation and management CPT® codes commonly used in your specialty are now included with their official description, lay description, coding tip, Medicare edits, and relative value units. Also included is a chapter with coding guidelines and tables to assist you in the E/M code selection process. Helpful illustrations. Detailed illustration section for a better understanding of anatomy. Code icons. Quickly identify new, revised, and add-on procedure codes. CPT® Assistant Identify that an article or discussion of the CPT®code has been inthe American Medical Association’s CPT® Assistantnewsletter. Use the citation to locate the correct volume. Quickly find information. All the information you need is provided, including CPT® full code descriptions, lay descriptions, coding tips, procedure code-specific documentation and reimbursement tips, HCPCS supply codes, clinical terms, Medicare IOM references, CPT® Assistant references, and associated ICD-10-CM diagnosis codes. Avoid claim denials and/or audits. Medicare payer information includes references from Internet Only Manual (IOM) guidelines, follow-up days, and assistant-at-surgery and modifier usage. CCI edits.Includes section with CCI edits for CPT® and HCPCS procedure codes with quarterly updates available online. ICD-10-CM table of malignant neoplasms.